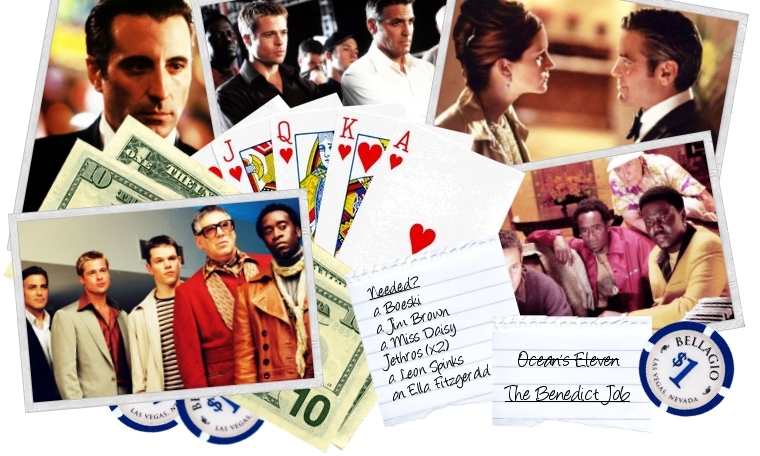 In Ocean's Eleven, wry, charismatic con man Danny Ocean (GEORGE CLOONEY) is paroled from prison and immediately begins orchestrating his latest plan, to pull off the most daring heist in the history of Las Vegas. The target? Three of the most popular casinos on the Vegas Strip: The Bellagio, the Mirage and the MGM Grand. Secured beneath 200 feet of solid earth below the Strip is a vault that safeguards every dime that comes through these three casinos, which happen to be owned by Terry Benedict (ANDY GARCIA), an elegant, ruthless entrepreneur. As smart as he is ruthless, Benedict doesn't hesitate to do whatever he thinks is necessary to get what he wants, be it hotel or girl. In this case, it happens to be Reuben Tishkoff's (ELLIOT GOULD) beloved hotel and Danny Ocean's ex-wife Tess (JULIA ROBERTS), who has moved to Las Vegas to begin a new life as curator of the Bellagio's Art Gallery. A man not to be trifled with, Benedict is secure in the knowledge that with its high-tech security system, the main vault beneath the Bellagio is impregnable. As is his relationship with Tess. Rusty Ryan (BRAD PITT), Ocean's most trusted cohort and the detail man of the outfit; Linus Caldwell (MATT DAMON), whose nimble fingers can pick any pocket; Basher Tarr (DON CHEADLE) the Cockney munitions expert; Reuben Tishkoff (ELLIOTT GOULD), who was muscled out of his hotel by the new king of Las Vegas and now sees a way to even the score; the Malloy brothers, Virgil (CASEY AFFLECK) and Turk (SCOTT CAAN), expert auto mechanics, drivers and poseurs; Frank Catton (BERNIE MAC), professional card dealer and observer; Saul Bloom (Carl Reiner), who thought he was retired from the flimflam; Livingston Dell (EDDIE JEMISON), the eyes and ears of the team, whose work on both sides of the law has made him a surveillance expert capable of tapping into the most sophisticated security system; and Yen (SHAOBO QIN), a Chinese acrobat whose unique talents make him the perfect grease man. When? The night of the Lennox Lewis-Wladimir Klitschko heavyweight champion boxing match. The take? Because the Nevada Gaming commission stipulates that a casino must hold in reserve enough cash to cover every chip at play on its floor, on a fight night, the vault is certain to contain at least $150 million. $150 million. Divided by 11. You do the math. 11 men, three casinos, all at once, in one daring holdup. In any other town, they'd be bad guys. Danny: Why do they always paint hallways that color? Rusty: They say taupe is very soothing.